STEPANAKERT—Azerbaijani forces fired a SPIKE anti-tank guided missile in the southeastern (Martuni) direction of the Artsakh-Azerbaijani border (Line of Contact) on Tuesday afternoon, the Artsakh Defense Ministry reported, just three days after Azerbaijan launched an unsuccessful offensive toward Artsakh positions. In addition, the Ministry reported that the adversary fired 2,200 times toward Armenian positions on the night of February 27-28, violating the ceasefire agreement 120 times while using weaponry of different calibers, including automatic grenade launchers and 60 mm mortars. According to the report, the Artsakh Army did not suffer any casualties. The bodies of the five Azerbaijani servicemen who were killed during the infiltration attempt were retrieved by the Azerbaijani forces on Monday. The Artsakh Defense Ministry stated its readiness for any developments and noted that it is taking preventative measures to counter the Azerbaijani offense to stop further provocation. The Ministry emphasized that the absence of the international community’s “strong and targeted” assessment of Azerbaijan’s actions created a situation where Baku considered it possible to unleash a military aggression against Artsakh in April 2016. “The escalation of tension on the Line of Contact, provoked by the Azerbaijani side, only deepens the distrust and postpones the prospects for a final resolution of the conflict,” said the Ministry. In the early hours of February 25, 2017, the Azerbaijani armed forces attempted an attack on the positions of the Defense Army of Artsakh (Nagorno-Karabakh), which was neutralized by the military units of Artsakh. The incident was the most serious violation of the ceasefire by Azerbaijan after the April War of 2016. Like in last April, it followed the systematic and deliberate steps by the Azerbaijani side on the gradual escalation of tensions, to which the mediators responded by untargeted appeals for restraint. The incident of February 25, 2017 is another proof of total disregard for the commitments assumed by Azerbaijan in the frameworks of the agreements of 1994 and 1995, as well as the agreements reached in Vienna and St. Petersburg. It is obvious that by increasing the degree of tensions on the Line of Contact the Azerbaijani side tries to check not only the combat capability of the Defense Army of Artsakh, but also the reaction of the international community to the use of force. It was the absence of international community’s strong and targeted assessment of actions of Azerbaijani authorities on disrupting the process of peaceful settlement of the conflict and preparing for war that to a certain extent, created a situation, taking an advantage of which, Baku considered it possible to unleash a military aggression against Artsakh in April 2016. The escalation of tension on the Line of Contact, provoked by the Azerbaijani side, only deepens the distrust and postpones the prospects for a final resolution of the conflict. We believe that the response to the provocative policy of Azerbaijan must be refraining from making untargeted appeals to the parties of the conflict and increased efforts on the practical implementation of the agreements reached in Vienna and St. Petersburg on strengthening the ceasefire and creating conditions for the resumption of the negotiation process. 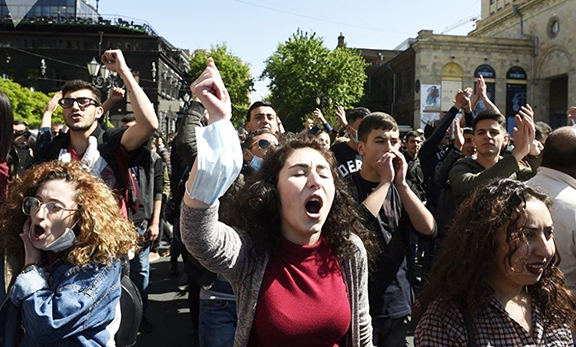 How much longer will the Armenian nation tolerate the Turkish/Azeri aggression? Time has come to blow a decisive defeat on the corrupt Azeri regime and liberate the rest of Armenian lands that were gifted to the Turks (by Stalin and his blood thirsty thugs) including Nakhichevan.